6 Oct :Stressing that greater participation of women in post conflict reconstruction is the “sine qua non” for lasting peace and security, India has called for more deployment of females in peacekeeping forces. 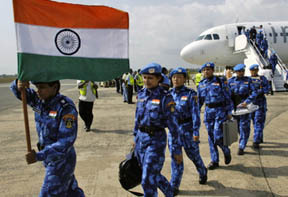 “India was the only country, which has contributed a female peacekeeping unit of 100 personnel, presently deployed in Liberia,” Indian envoy to the UN, Hardeep Singh Puri said. Presently, women comprise only 8 percent of UN police officers and about 2 percent of the military personnel deployed in peacekeeping operations. The Security Council also unanimously passed a resolution calling for greater participation of women and girls in peace making efforts following conflict. After a similar resolution was passed nine years ago only 16 countries have so far adopted national action plans to make the resolution a reality. The new resolution reiterates the obligation on member-states to increase women engagement in political solutions, economic management and aid distribution. “India has consistently held that greater participation of women in areas of conflict prevention, peace negotiations, peacekeeping and post conflict reconstruction is the sine qua non for lasting peace and security,” Puri said. “Let me assure you that India will continue to contribute positively to United Nations efforts in protecting vulnerable sections, particularly women and children, in conflict and post-conflict societies,” the Indian diplomat noted. Calling for a greater role of women in building peace after post-conflict situations, UN Chief Ban Ki-moon, promised to throw open the doors of the United Nations to women. “I will continue to do my part, including appointing more women to positions of leadership,” Ban said. The resolution calls upon the UN Chief to increase the number of Special Representatives and Envoys to boost women participation in peace building missions around the world. It follows a special Security Council session last week chaired by US Secretary of State Hillary Clinton that unanimously passed resolution to protect women against sexual violence.